YEAR 2014 witnessed the best ever gains made in the history of equity markets in India—a gain of around 35-40 per cent when the Sensex came to a kissing distance of the 29,000-mark. The ongoing correction has taken some sheen off the market and the big question every time the market hits a new high is “Is it different this time?” Most times, the bull markets have abruptly ended, giving investors a rude shock. These investors are those who were neither willing to accept nor prepared for a steep fall, putting forth arguments on the robustness of the economy, too much of liquidity and so on. The main reason for the correction, besides being part of the global sell-off, is that the FIIs are pulling out from the Indian market and heading for the safety of US treasuries. Russian events have made global investors risk-averse—its currency has witnessed a freefall and interest rates have almost doubled. An almost 50 per cent fall in oil prices is also considered a big reason for the current sell-off as it is indicative of lower growth. Global investors are also selling other assets to cover losses in oil. However, there are big chances that deflationary pressures in the West will spur another round of quantitative easing. The US Fed is, at the least, likely to delay the much anticipated rate hikes. Amongst the local reasons, currency volatility is the biggest culprit with the rupee declining to 64 a dollar. The widening trade deficit in November to an 18-month high has added pressure. 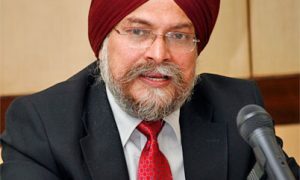 It is speculated that the RBI may delay the rate cut as that may fuel capital outflows, depreciating the rupee further. Parliament’s inability to pass any major legislation has also not gone down well with investors who think that economic recovery will get delayed. Yet, I believe that “it’s different this time” since our macro-fundamentals have improved a lot and we are the most favoured investment destination for foreign investors. The wise policy-making by the RBI is likely to prevent any steep decline of the rupee. Moreover, higher foreign exchange reserves of US$314 billion and lower current account deficit of around 2 per cent of the GDP have put us in a stronger position to defend the rupee if there is a heavy outflow of dollars from either debt or equity markets. With inflation now moderating, the interest rate outlook looks benign. Since the Indian market has witnessed the steepest rise in 2014, it became the natural choice for profit taking by the FIIs. India, therefore, remains a multiyear story though 2015 may see relatively tempered returns due to the sharp rally in 2014. So far the market has been led by macro changes and the same is likely to continue for another year or so. It is only from FY 2016-17 that the market may be led by earnings growth, a phase that could continue for as long as 3-5 years. Investors can, therefore, use the current correction as an opportunity to accumulate quality stocks at reasonable valuations and should not attempt at timing the market because when stability returns, they may find that they have missed the bus again.